These cookies man, they are one of the most popular recipes on this site and for good reason. We have a pumpkin cookie that is crisp around the edges but still soft and fluffy in the middle, loads of warm spices, and a creamy cream cheese frosting. The smell of them baking is pure heaven and fills the home with all the spices and smells you want this time of year. 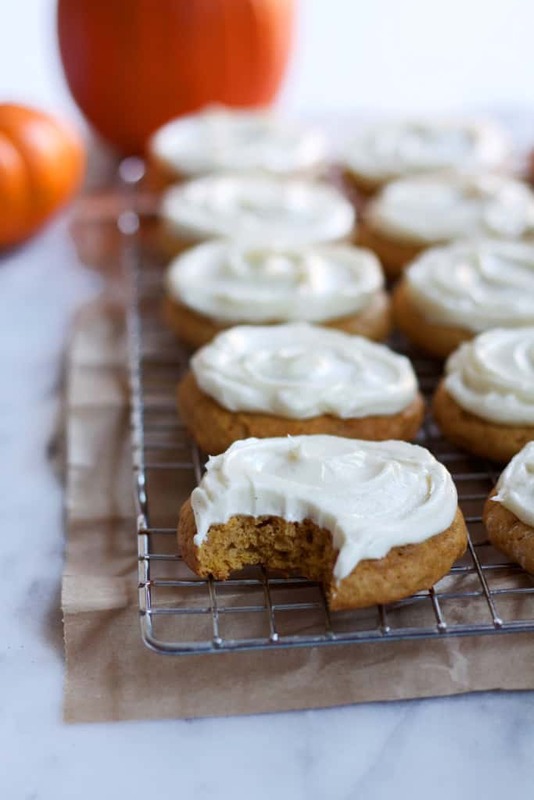 This recipe is one I’ve been dreaming about for awhile: a pumpkin cookie that is crisp around the edges but still soft and fluffy in the middle, loads of warm spices, and a creamy cinnamon frosting. All those flavors together may have been my favorite cookie ever, but I know I think that a lot. Bake for 13-15 minutes or until the edges are set and just turning golden. Cream butter and cream cheese together. Slowly add powdered sugar and mix with an electric mixer until thick and creamy. Add vanilla and mix on high. When cookies are cooled- spread frosting on top with an offset spatula.